Welcome back to Semester 2. I trust families are well rested and students have returned with enthusiasm to achieve to their full potential for the second half of the school year. This term we welcome back Mr Golding, Head of Physical and Health Education from long service leave in Semester One. My thanks to Mrs Wendy Martin for her leadership of the Health and Physical Education Learning Area for the first half of the year. Mr John Cuka has also returned to Mater Dei in the Mathematics Learning Area for Semester Two on a temporary contract. Throughout the next few weeks some of our students are scheduled to perform in the 29th Annual Performing Arts Festival for Catholic Schools and Colleges. The festival officially opened on Friday 20 July with a Mass at Infant Jesus Parish in Morley. Thank you to Marta Brak, Jamie Grove, Mrs Boyer and Mr Basile for representing the College and accompanying me at the Mass. The students of Performing Arts have been busy rehearsing. I wish all students well in the weeks ahead. The Catholic Performing Arts Festival also includes the Angelico Exhibition at the Forrest Centre, opening on Tuesday 14 August at 6.00pm. Once again, a selection of Mater Dei students’ art will be on display with the many other Catholic secondary schools. In addition to the Catholic Performing Arts Festival, this year the St Mary’s Cathedral is holding the first Orchestral Mass this Sunday 29 July at 11am. I am so pleased that four of our students will take part in this new initiative. Well done to Marta Brak and Melissa Hemetsberger who will be playing the flute, Heather Bongionvanni playing the clarinet and Joshua Li playing the violin. Thank you to the families who attended the parent/student/teacher interviews on Tuesday 17 July. Such opportunities are vital in providing valuable feedback and strategies essential for the learning process. The College Leadership Team have been busy with interviews with the Year 10 students and parents as they undergo the Course Selection for Year 11 2019. Thank you to the staff and for the support of families who have attended interviews. As mentioned in numerous communications, the AFL students are doing particularly well. This week our senior boys competed in the finals at McGilvray Oval and defeated Comet Bay to become the 2018 Jackovich Division Premiers. An outstanding result! Our girls have an amazing opportunity to compete in the Grand Final at Optus Stadium at 11am this Sunday as a curtain raiser for the Fremantle v Hawthorn game. I encourage families to attend to cheer on MDC. In closing, the 25th Anniversary Fair and Showcase on Saturday 8 September is fast approaching. More information will go out to families in the next few weeks about this Mater Dei College community event, including the stalls, activities and the Showcase of our students’ talents. Please keep this date clear. We welcome all families, friends and community members to our College for an afternoon of fun and hospitality. It is wonderful to see so many students at Mater Dei excel across a range of sporting disciplines with state and national representation. 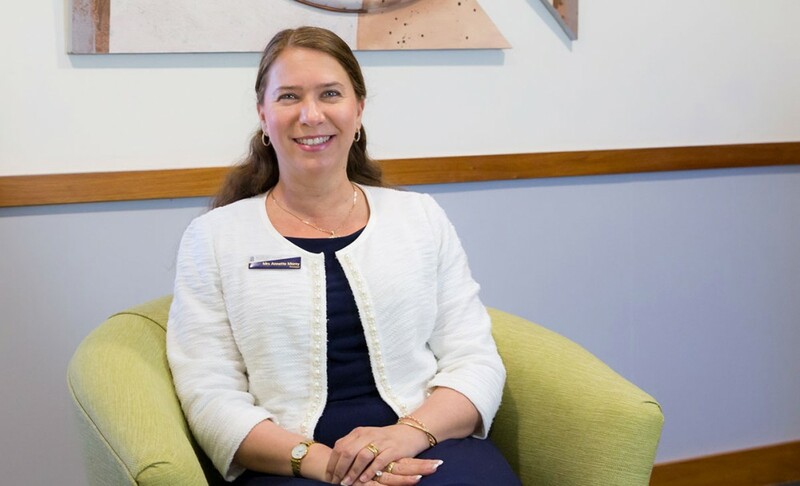 What many don’t know however, is that such experiences can significantly contribute to their education and the attainment of the Western Australian Certificate of Education (WACE). The School’s Curriculum and Standards Authority offer ‘Elite Sports Performance’ as an Authority-developed endorsed program that enables a student engaged in representative or competitive elite sports activities to be recognised for the significant learning encompassed within such activities. The program requires that a student commits a minimum of 110 hours to the development of technical skills and knowledge of a specific sport through sports development programs such as those provided by the WA Institute of Sport, sporting associations’ sports programs and state or national development squads. Typically, a student would have been through a selection process and identified as gifted or talented in a particular sport. The program must involve one or a series of sports performances or competitions at a state level or higher. The program will also develop personal qualities such as commitment and discipline while building on a range of interpersonal skills. For full details on the Elite Sports Performance Endorsed programme please Click Here! If you believe that your son or daughter may qualify for this, I would invite you to contact me to discuss this further. Endorsed programmes are not limited to Sport. If you undertake a significant activity outside of school hours I would suggest you check out the full list of available programmes on the SCSA website accessible through the following links. If you require further information on any of the programmes and how they could assist your child, please do not hesitate to contact the College. Among the key messages presented at the opening whole school assembly for this term was the importance of student attendance and punctuality. Educational research indicates a clear relationship between student rates of absenteeism and academic achievement. 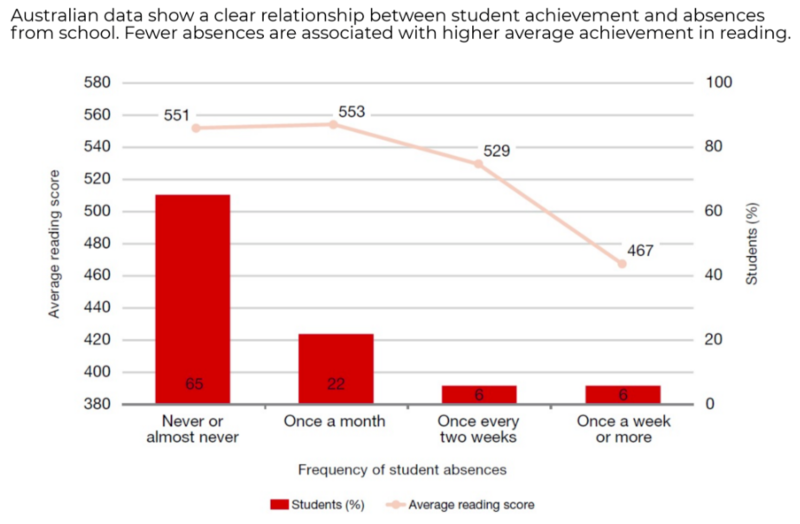 For example, the graph below published by the Australian Council for Educational Research illustrates the impact that student absences have on achievement in reading. Attendance rates of less than 90% are concerning as students miss out on valuable learning experiences, including assessments, and interactions with teachers and peers which cannot be replicated when the student returns. Likewise, problems with punctuality are also found to have a negative impact on academic success and can lead to disengagement from learning. 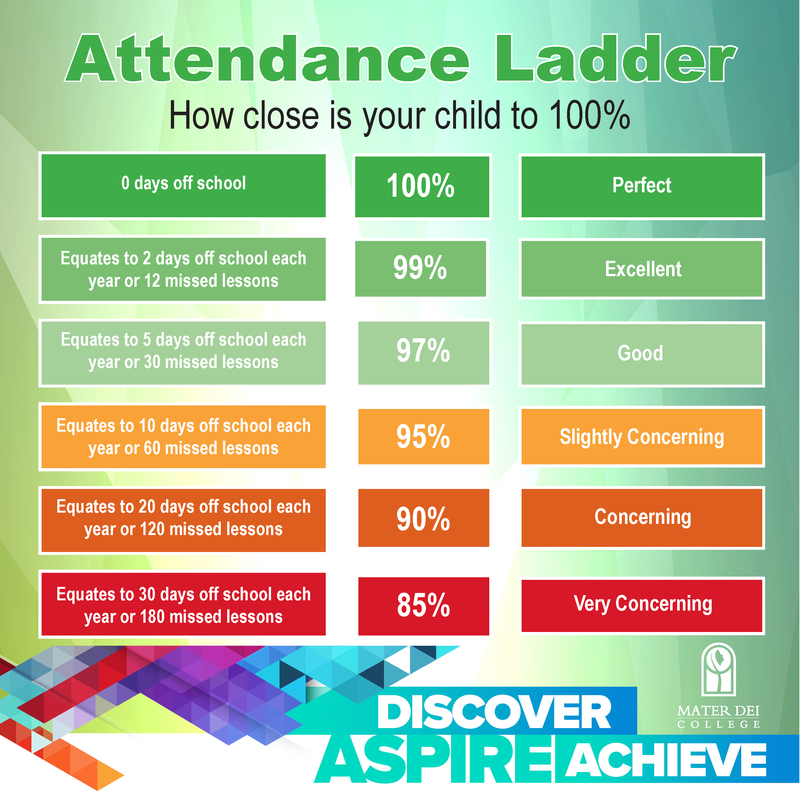 So how close is your child to 100% attendance? The diagram below provides an indication of the level of concern you should have for your child. Daily attendance at school is required, and students are expected to arrive at school on time for the commencement of Homeroom at 8.35am each morning. Days off school and time lost due to lateness add up to lost learning. Parental support for matters related to attendance and punctuality is of the upmost importance. For more information, please refer to the College Attendance Policy on SEQTA, or contact your student’s Year Coordinator or Deputy Principal. 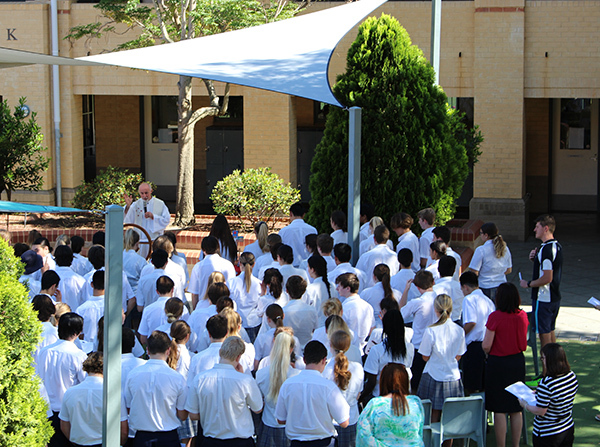 At the request of the Western Australian Bishops, Year 9 students in Catholic schools across Western Australia will take part in The Bishops' Religious Literacy Assessment (BRLA). This online test assesses students’ knowledge and understanding of the content of the RE curriculum using a combination of multiple choice, short and extended response items. Students’ faith is not assessed. Student reports are produced by Catholic Education Western Australia (CEWA) and will be published via SEQTA in Term Four. Note that the date and time which students will complete the BRLA has changed since last term. Students will now sit the assessment on Wednesday 1 August (Week 3). Please contact your child’s Religious Education teacher or Head of Religious Education, Dr Keady, if you have any queries regarding the administration of The Bishops' Religious Literacy Assessment. The next round of OLNA will be held in Week 7 of this term and is fast approaching. Students in Years 10, 11 and 12 who are still required to pass one or more OLNA assessment areas are strongly encouraged to practice their literacy/numeracy skills using the online subscription which was purchased for them. This package enables students to practise questions from past OLNA tests at home or at school, and provides specific feedback to students including suggested strategies. Parents, please encourage your Year 10, 11 or 12 student to login to https://olna.com.au/ using their Mater Dei email address and password and practise regularly. The use of Drugs and Alcohol by young people is not a new phenomenon and the detrimental physical, social and psychological issues surrounding this have been well researched and documented. In recent times, we frequently see media reports and advertising about the relationship between alcohol, violence and extreme risk-taking behaviour. We now also know that alcohol and drugs can have a serious impact on a student’s ability to learn and participate in their school community. 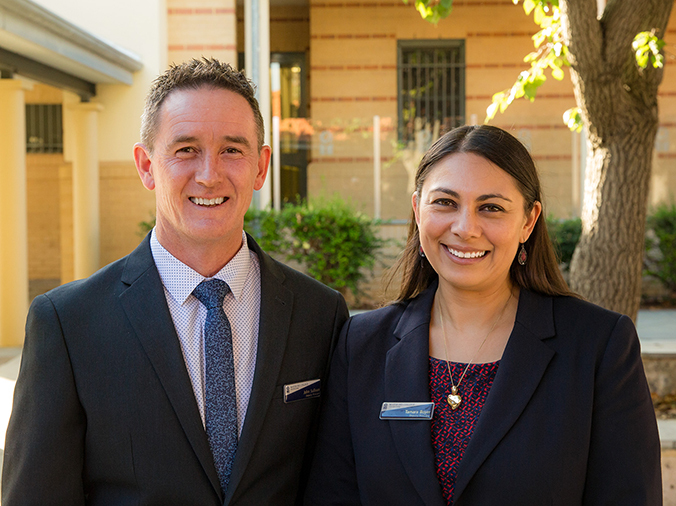 At Mater Dei, we recognise the importance of addressing this issue and providing information, education and resources for our students, families and staff. 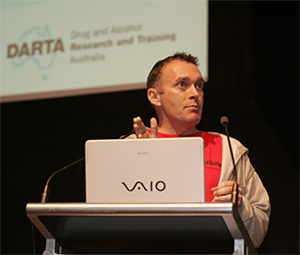 As such, Mater Dei is excited to announce that Founder and Director of Drug and Alcohol Research and Training Australia (DARTA), Paul Dillon will be returning on Wednesday 1 August to address our senior school community. Paul will address Year 10-12 students throughout the day and in the evening Paul will be discussing up-to-date trends in Drug & Alcohol use in teenagers for parents. 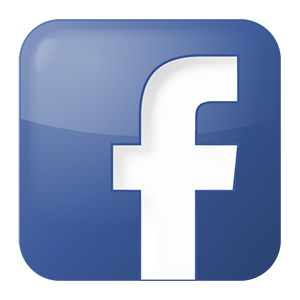 For further information on Paul’s message, you can check out his blog http://doingdrugs-darta.blogspot.com.au/ and follow him on his Facebook page: Drug and Alcohol Research and Training Australia (DARTA). Year 9 Encounter Days were held over two days on 19 and 20 June. The program included workshops about drugs and alcohol, career choices as well as working on the Year 9 Mission Project for Brother Ollies’ Wheelchairs for Kids. The students spent a day at St Anthony’s reflecting on their likeness to God and their ability to show goodness in everything they do. The two days were very successful and the positive feedback from students demonstrated the importance of these days and how they add value to their learning and spiritual development. On Tuesday and Wednesday (19-20 June), the Year 9s spent a day at St Anthony’s Parish Hall to develop our relationship with God. We had the opportunity to broaden our understanding of being made in the image and likeness of God and discussed how we have the capacity to reflect goodness in everything we do in our everyday lives. We began the day with some fun ice-breakers to help become more relaxed with our group before beginning to talk about what we define to be ‘good’ and ‘evil’, allowing us to express our ideas in our own creative way. This set the foundation for the next discussions, about what we think are the characteristics of moral and immoral people and talked about examples of some acts related to these. Elaborating on both discussions, we watched two movie clips from Harry Potter and Star Wars, and talked about what features both the good and evil characters possessed. Using a parable from the Bible, the Prodigal Son, we talked about how forgiveness and showing good characteristics can cause a ripple effect on the receiver who is being forgiven, using our relationships with our parents as real-life examples. We even got time for personal reflection, time to write down when we show goodness. Overall, what we got out of the day was very enlightening and gave us the chance to reflect on ourselves, on God and grow a more deepening understanding of what good and evil really are and what forgiveness can do to change the view of others. We got the opportunities to interact with our peers and with teachers to further enrich our learning experiences. Article contributed by: Ashlee Harwood, Year 9 student. During the Year 9 Encounter Day, we had a presentation from two inspirational people who established The Yellow Ribbon Project. Tristan and Jade, both former drug addicts, openly shared their story to the Year 9s here at Mater Dei College. While they were here, they told us about how drugs could easily spin one’s life out of control and how it did so to them. The Year 9s got to hear Tristan and Jade’s story on how one small encounter with drugs led them on a path that was almost impossible to find their way back. They both shared their experiences with different drugs, dealing drugs, run-ins with the police and even prison and answered any of the students burning questions. These two strong individuals now have dedicated the rest of their lives to work on educating others in the hope that they make wise and informed decisions in their lives. Making the decorative wheelchair bags for Brother Ollie’s organisation ‘Wheelchairs for Kids’ was one of the many highlights of the Encounter Days. Brother Ollie’s organisation donates wheelchairs to disabled children in third-world countries. The amazing work of Brother Ollie means many children are now getting the opportunity to get to school and are getting to be mobile. 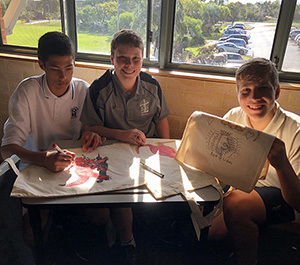 Each Year 9 student got to design and trace a picture onto the bag. Inside the bag was a packet of colouring pencils and a notebook with a personalised message on the inside. Brother Ollie and all of these volunteers are doing amazing things for these children and the Year 9’s feel truly privileged and grateful to be a part of this amazing experience. 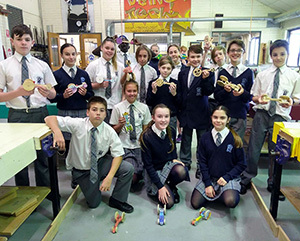 The students challenged themselves through their design and construction and produced and wide array of car types. Along with some great designs and decorations. Next month a group of Year 10 students will travel to Busselton to represent Mater Dei College in a nation-wide competition called Pedal Prix. Students have been working over the last few months to build their trike, which is a human powered vehicle, in preparation to compete against teams from other schools and community groups in a 6-hour race in a closed, controlled circuit. A special thank you goes to Deltaworks, Campion, Bunnings & Tara Uniforms for all their support and assistance. To show our appreciation, this edition of the newsletter has a flyer advertising Deltaworks and the services they provide. If you or anyone you know, are seeking IT Management services, please consider Deltaworks. On Saturday 21 July, the Mater Dei College Chess Team went to Leeming Primary School where the Chess League finals were held. The main chess season in Semester One was a series of matches between other colleges, and in this series of matches Mater College found itself in the ‘A’ division. Our fledgling team of Chess players at MDC is comprised mainly of students from Years 8 and 9, but some of the schools we competed against were fielding students from Year 12. Notwithstanding this; three of our players received trophies acknowledging their individual achievements. To celebrate Children’s Book Week in Week 6 and English Week in Week 7 of this Term we are inviting ALL students to have a go at some creative writing and enter our Writing Competition. The theme is TREASURE. Lost treasure, found treasure, missing treasure. Is the treasure a person, an animal, gold or jewels? You decide. You can write a short story, a poem, a play script, a feature article, a fable, a fairy story, a blog. You decide. So, what's in it for you? The acclaim of your peers and a $50 JB HI FI voucher (Runner-ups in both age groups receive $25 voucher). Most importantly however, you get the chance to have your work published in INSPIRE, the Mater Dei literary magazine published in Term 4. See Mrs Boyle in the Library or Ms Laing in English for more information. Thank you, Mrs Boyle & Ms Laing. You can learn something new every day if you listen! For Steffi, going to school every day is an exercise in survival. She's never fit in with any of the groups at school, and she's viciously teased by the other girls in her class. The only way she escapes is through her music - especially jazz music...When Steffi hears her favourite jazz song playing through an open window of a retirement home on her walk home from school, she decides to go in and introduce herself. The old man playing her favourite song is Alvar. When Alvar was a teenager in Sweden during WWII, he dreamed of being in a real jazz band. Then and now, Alvar's escape is music - especially jazz music...Through their unconventional friendship, Steffi comes to realise that she won't always feel alone. She can go to music school in Stockholm. She can be a real musician. She can be a jitterbug, just like Alvar...But how can Steffi convince her parents to let her go to Stockholm to audition? And how is it that Steffi's school, the retirement home, the music, and even Steffi's worst bully are somehow all connected to Alvar? Can it be that the people least like us are the ones we need to help us tell our own stories? All staff and All students are invited to enter the MDC Book Week Chess Challenge! Sign up on the sheet in the Library or email Mrs Boyle. Matches will commence next Wednesday 1 August, in the Library at Recess and Lunch. It is a knockout competition and draws will be placed on the Library door and updated each day. Finals: to be held in Week 6 – Book Week! Rules: no speaking and standard chess rules. Official chess timers used in the finals only. After winning three of their four matches in the Round Robin Competition of the School Sport WA Champion Schools Football 2018, the team made it through to the first round of the Knockout Finals, playing Kinross at Kinross College on Tuesday July 24. After some wet wintery days preceding the match we were lucky to have blue skies and sunshine for perfect match conditions. Kinross were very aggressive in attack and had many unsuccessful shots at goal before finally scoring in the second half of the first term. Our girls were definitely under pressure but with Andrea Moyo scoring just before half time we were much more optimistic going into the second half.Despite consistent work in the defence form Anna Daley-Graham, Maggie Beck with & Isabel Chirikure, we were unable to hold them off and finished with a 3-1 loss. I am very proud of the girls and the sportsmanship and commitment to the team during a busy Term 2 and over into Term 3 for the finals. Thank you to our linesmen, Lachlan Daley-Graham and Thuto Moyo and our very enthusiastic one-man cheer squad in Mr Moyo! The Junior Boys Soccer team played their season in Term 2, spanning four games (one at home, the other were away games). The team was excited, to say the least, before we played Ashdale High School at home for our first game. However, that confidence disappeared against a very effective Ashdale team, when at half time we were sixteen goals behind. Mr Murray’s halftime talk helped, as we only conceded 5 in the 2nd half, the game finishing 21-0 to Ashdale. We played our second game against local rivals Joseph Banks High School. The boys wanted to improve after being well beaten by Ashdale. The team rose to the occasion, playing a lot better against a talented attacking Joseph Banks team. Our boys held their own as the half time score was more favourable (2-2). Although the boys kept up a spirited performance against Joseph Banks, we still lost 4-3. The boys were determined to win their third game against Saint Stephen’s, Carramar. We started strongly with a goal from midfielder Rylan Thomas then two more goals from us finished the job, as the boys won 3-1 against a talented Saint Stephen’s team. The boys’ final game of the season was against Woodvale High School, another one of our local rivals. The team wanted to walk away from the season with their heads held high, but it wasn’t going too well when at half time both co-captains, Cooper Robinson and Oskah Bergersen, who had been an important part of the team as the first-choice centre back pairing, had to go off. Unfortunately, the boys fell behind and lost 7-1 against a technically adept Woodvale team. Thank you to Mr Murray, Cody Bingham (Year 10) and Jude Gauntlett (Year 10) for their coaching during the season. Thanks also, to Miss Wheeler for her support in the background. Report compiled by Oskah Bergersen (Year 7). 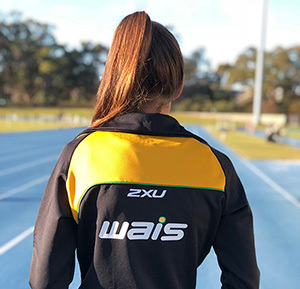 Adding to Rhiannon Clarke’s supporting success, Rhiannon has officially completed her induction and has been accepted into WAIS (West Australian Institute of Sport). Congratulations! WA’s leading, largest and most attended careers event is happening. Students and parents can visit the expo (free of charge); get career advice from Jobs & Skills Centre staff; speak to lecturers about courses available in 2019 or ‘try a skill’, like bricklaying, broadcasting or virtual reality!